Lost rhythm with this blog. A month of year-end activity at Camberwell– an intense time, which rightly takes over. We have some community there. I have been thinking quite a bit recently about my teaching, after a year of trying some new things. I have to find conjunctions always with making work — never, ever to take focus there away from students' work — but more in order to have some centredness in moving between the two. 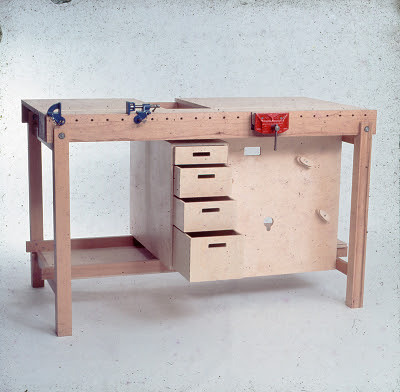 So it is fortuitous when a seam of working interest finds that the maker was an educator; or associated with the process of teaching. Above, by Richard Hollis, designer of John Berger's seminal Ways of Seeing (1972). This symbol, part of a mid(? )-1970s project, Language in Action, aimed at the teaching of English in primary schools, directed by Dr. Joyce Morris. I was reading his account of working with Norman Potter, author of What is a designer: things, places, messages and founder of the Construction School, the subject of ongoing research by James Langdon, to be presented at Corner College on the 29th of this month. The School, which existed in two phases between 1964 and 1979, was an experiment — a 'new bauhaus' — at the West of England College of Art, Bristol. 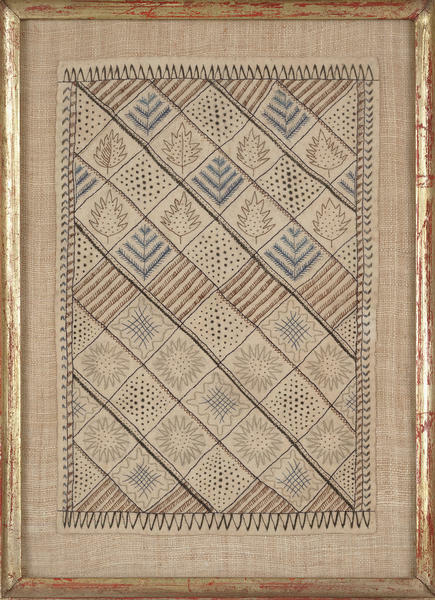 An embroidered linen panel, from the main body of an unfinished bag by Dorothy Larcher. Measuring 29.2 x 19.6cm. 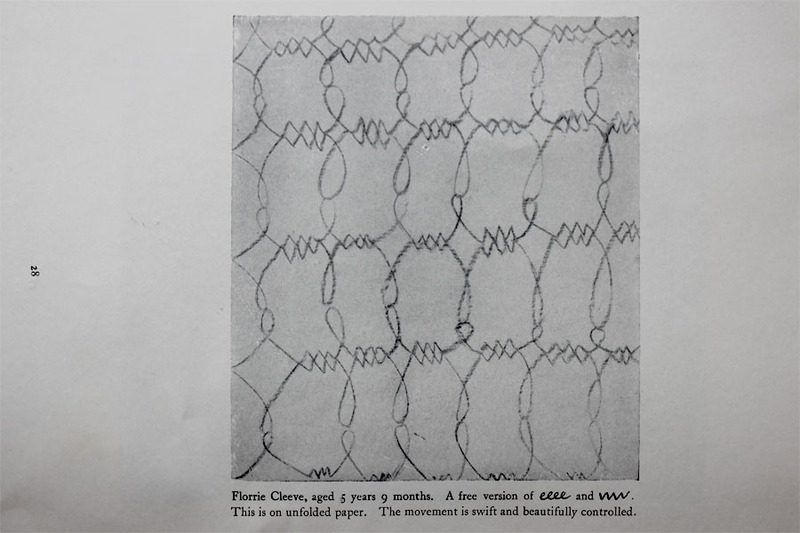 This piece (and image) is a part of an archived collection of Barron & Larcher's work at The Crafts Study Centre, Farnham. 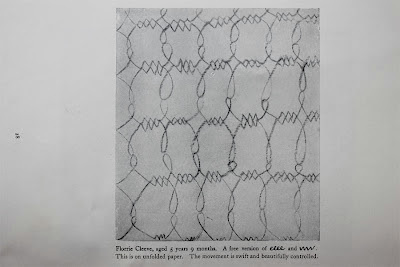 I've been interested in both them and their work for some time, since Brian Whitewick — our textile screenprint technician — showed me some images of their hand block-printed indigo resist textiles. 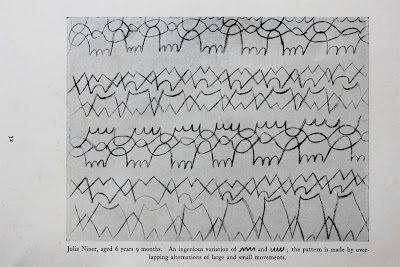 "The patterns were created by arranging letters by family group, such as ‘V and W, which are made with one continuous zigzag movement’, or ‘U, C, G, O and Q, which are all made without lifting the pencil except for the tail of Q, which is an added stroke’. This exercise taught a simple writing rhythm and introduced cursive writing forms. As the child progressed, lessons evolved from pattern drawing to writing in a neat cursive form, which maintained a free quality of line. 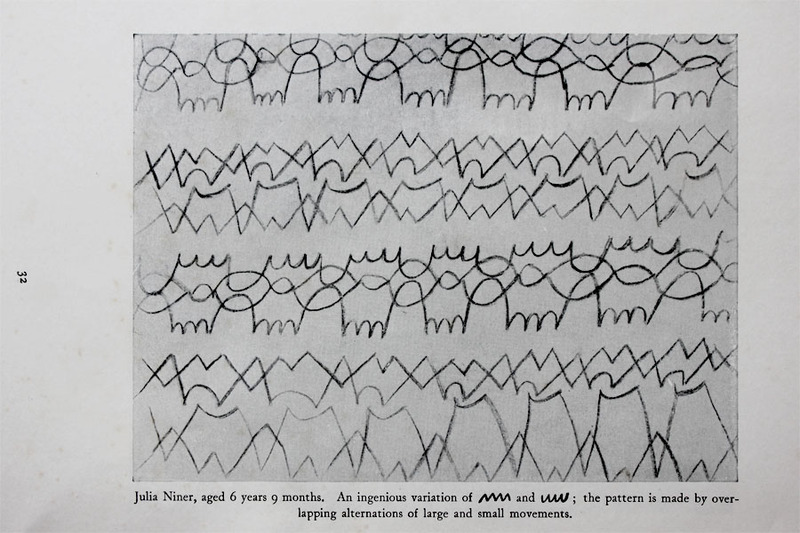 Richardson hoped that pattern-making would continue after the child learned to write, and encouraged her students to decorate the pages of their written assignments with their own patterns." 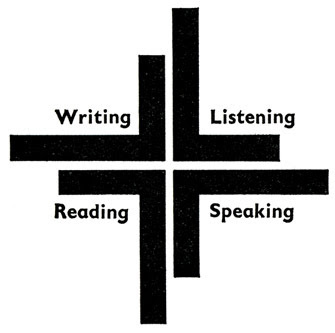 Back to Richard Hollis' work for Language in Action. 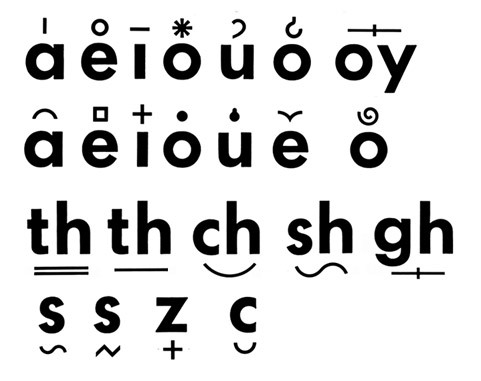 This, a set of glyphs adapted out of Futura, to represent the 21 vowel sounds. 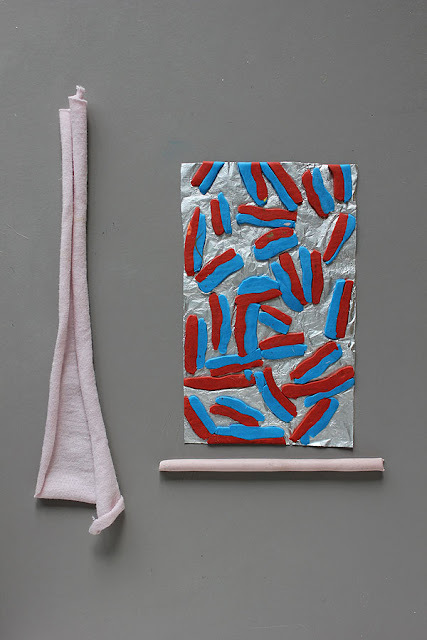 It's clear that each of these exercises connect as stimuli for currently developing vocabulary applied as stitch, appliqué and print for the bag and chair projects. I continue to try to tap a space between pictures and words. A bit to the side but connecting in that his work is showing (until tomorrow) at Chelsea College of Art & Design, is Max Clendinning. 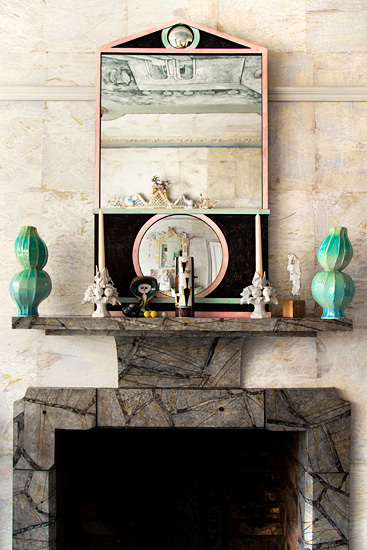 These lovely images of his home taken by Anna Huix. 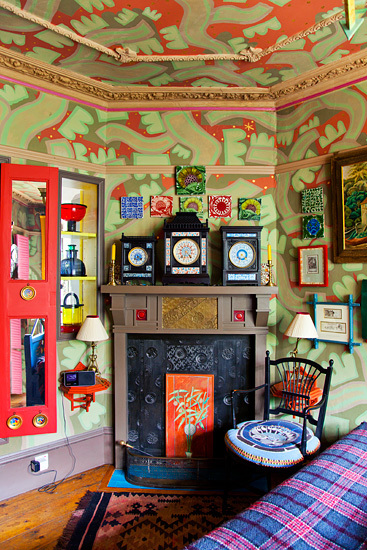 The configuration of these rooms and their contents giving great spirit to me at the moment. Sally and I are going to see before it shuts. Nice for Sally to discover he hails from Co. Armagh. His furniture strikes the odd, design-historical-bucking note of other work from these isles. Not quite hitting the internationalism of mainland Europe or USA. Beautiful in its (apparent) awkwardness to manufacture. 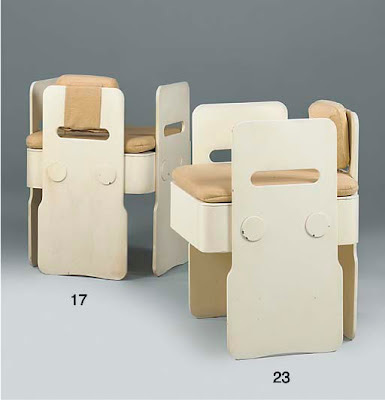 Maxima dining chairs (1965), via Christies. So this has been a rambling post, after so much silence. But the point at the moment is of reflexive activity, between teaching, making and thinking about both. Something to inform both, without doubt, is the creative time passed with the children. 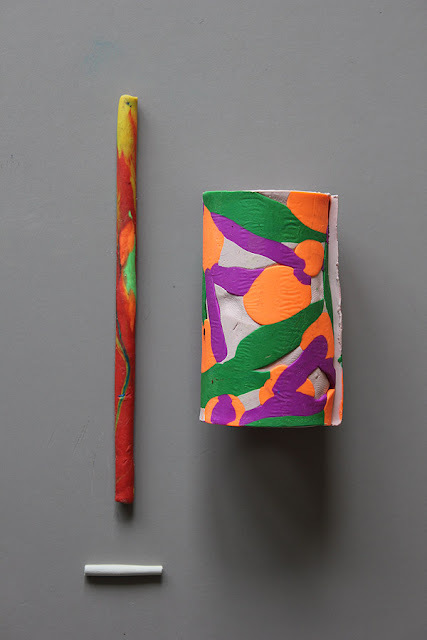 These plasticine forms were made with Syd, during the ebb and flow of Open House, finding some absorptive out-of-the-way play in the kitchen. 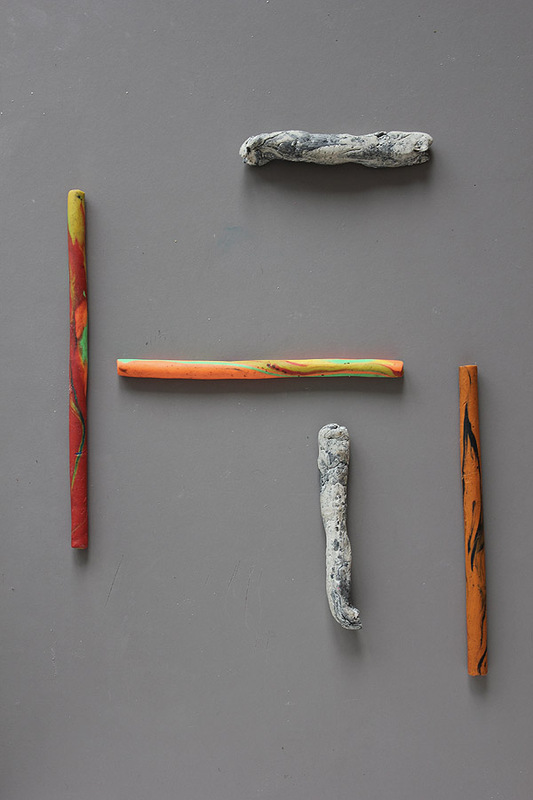 There is some key into the appeal of Clendenning's home and Richardson's hand-eye strokemaking. Syd has a good hand and an imagination I can only half-imagine. Anything I show him, he shows me double back. Hope this doesn't sound pompous but this calls up a final note on education. Something just discovered, that is really exercising; especially when one works for an institution. From The Ignorant Schoolmaster: Five Lessons in Intellectual Emancipation (1985), Jacques Rancière is described as arguing that "educators can channel the equal intelligence in all to facilitate their intellectual growth in virtually unlimited directions. The schoolmaster need not know anything (i.e., s/he may be ignorant). With the premise that all are of equal intelligence, and the insights from which knowledge is constructed can be found in any collective educational exercise founded on this principle."